Its a lot like Christmas. Just got the call from EQ my heads are on their way back from California. Will post pics as soon as they come in. Who cares???? I want to see pics!!!! Can somebody please ban this guy???? glad to see parts coming in! 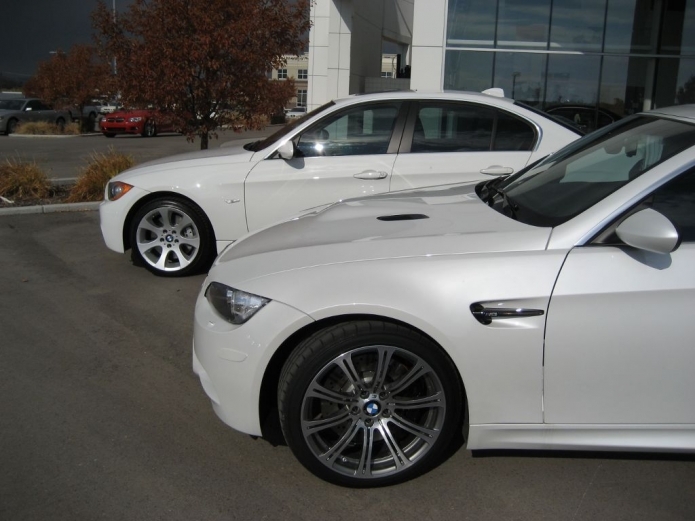 After hearing you mention wanting a White WRX and the possibility of repainting the car, I think it would look great in Alpine White Metallic similar to the M3 in the picture below. Just curious? What would be next after this? a ****ing space ship. next level transportation maneuver. **** 4 wheels son, im airborne. So, chinese food sprinkled with crack.... does that make you hungrier quicker bc you'll be tweaking from crack sprinkles? lol. This thread needs to be renamed "Area 1320's official Shop Ornament". The only real update I have is that I dropped off the heads about two weeks ago. I have no pictures because the heads came back dirty and I was irritated lol. It's all in Ryan's hands now. Here's to praying the road blocks are minor, I can't wait to drive it out to Sonic. Frankly I can't wait to drive it period. Rods, bearings and pistons are in the new block. So lookie what I got texted. Just have to get my tgv's down to the shop. Yeah I was shocked. Last I heard I was going to have to order the shimless buckets I needed. It exists in pieces lol. I'm in the middle of putting together ikea furniture while day dreaming about the windows down and the radio up and if I can still hear the radio over the ewg My excitement for this car is only falling behind my wedding day and honeymoon. PS I touched your motor.